This is our last day in Lisbon as we are leaving tomorrow morning for Budapest. We decided to take the train to the beach, but first a trip to the fresh market to buy a sea bass and belgian endive for tonight’s dinner, which we will capture on video for Cogeco's Shoestring Gourmet. We got to Cascais (pronounced cash-k-eye-sh) just as the tide had reached its lowest point. The exposed rocks were quite a surprise. We were trying to estimate how low the tide was from last visit and decided to check on the web when we got back. As it turns out, we had arrived at the lowest point of the day, 11:12 am. The difference between high and low tide was around 12 feet according to the tide charts. We stopped for lunch at a small cafeteria called Beth Shalon, which was just up from Estoril Beach. We were told prices would be cheaper the farther away from the beach you go, and they were. Lunch was delicious. I had a tasty meatloaf with spinach while Jill had Alheira sausage with a fried egg. Jill could not stop raving about how good the smoky taste was. I got to try several pieces and it was one of the best sausages I have ever eaten. 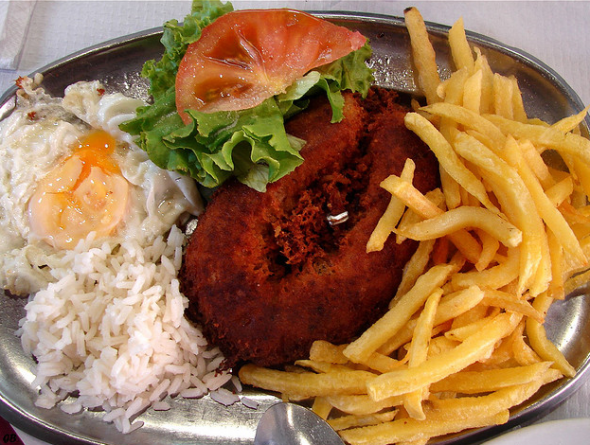 The original Alheira was a pork-free sausage that was invented by the Portuguese Jews during the Inquisition. When the practice of the Jewish faith was outlawed, the Jews, especially the large communities in the northern region, were easily found as they lacked the traditional pork sausages that hung from the smokehouses. To disguise themselves, they created their own sausage that was pork-free.